Although this panda mural was painted in Grimsby, Ontario, I sell adorable animal wallpaper murals that ship for FREE in Canada and the USA. They’re really easy to hang and completely removable when you’re ready to redecorate. Keep scrolling down for some panda wallpaper mural ideas. 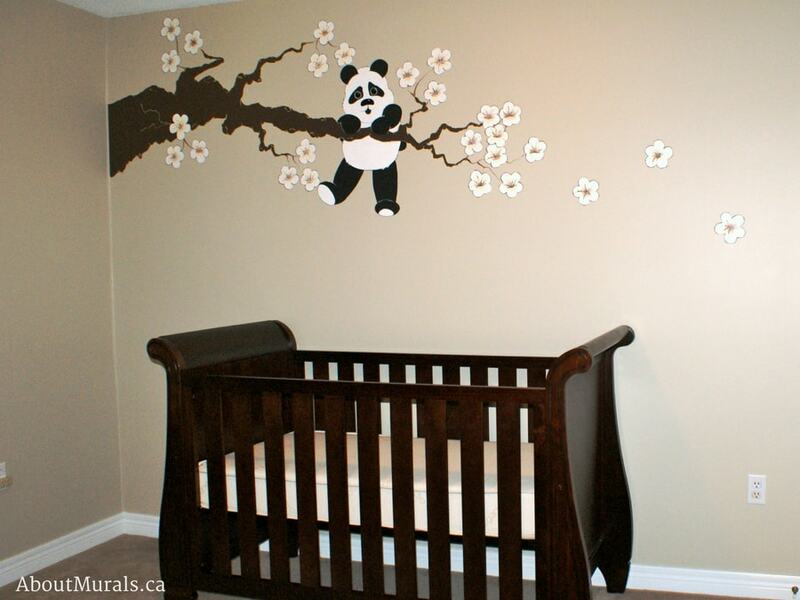 Are you thinking of adding a panda mural to your baby’s nursery? Here are some pics of a wall mural that I painted to help inspire you. While she was still pregnant, Suzanne was looking at black and white wall murals to help her newborn strengthen eyesight. She also wanted to keep the mural neutral because they didn’t know if they were having a boy or a girl. They decided on a panda mural. I painted the bear right over the crib so the baby would have something to look at. And I knew that as the baby grew, she’d want to stand and pet her bear friend. I paint all my murals with non-toxic acrylic paint and no-VOC latex paint so it’s safe for your baby to play and sleep in the nursery – even the night that I finish the mural. My wallpaper murals are all eco-friendly, too. I added the branch of a cherry blossom tree into the panda mural and Suzanne asked if I could paint some of the flowers blowing off the tree. 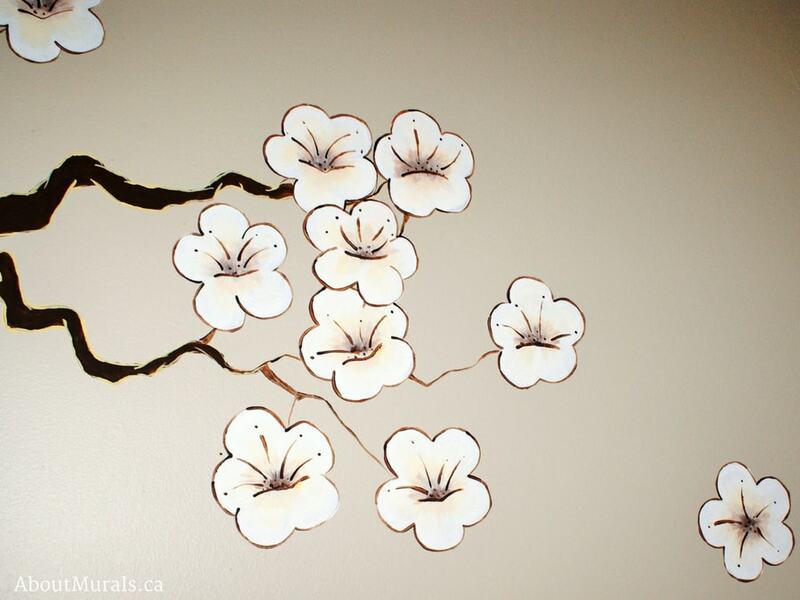 We kept the cherry blossoms a neutral white with brown colour so it was suitable for a boy or a girl. If you’re looking for a panda mural and you like my style, you can hire me! I’ve painted murals, from Toronto to Niagara Falls, since 2005. I even painted a nursery mountain mural for a Mike Holmes TV Show! 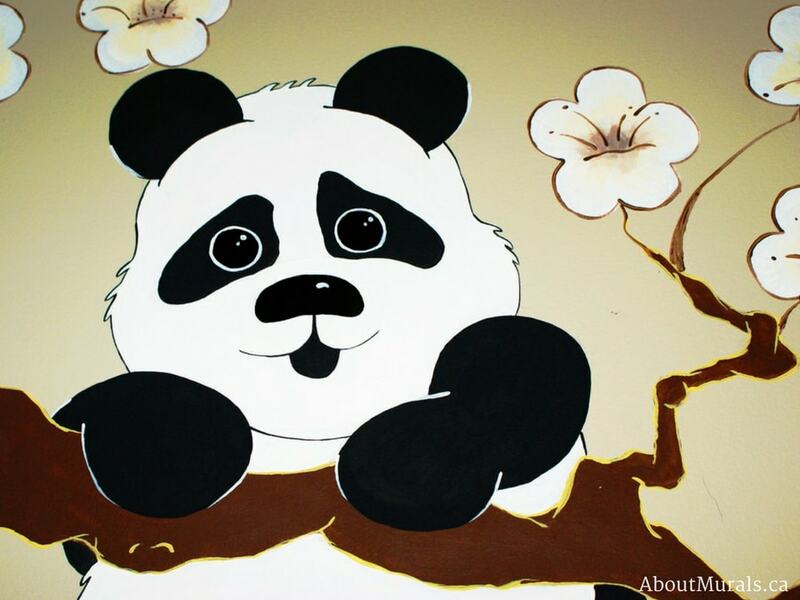 Or…Browse my Panda Wallpaper Murals!